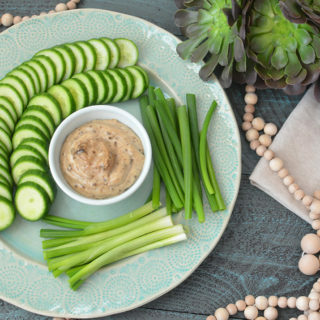 Want to create a dish that looks oh so fancy? 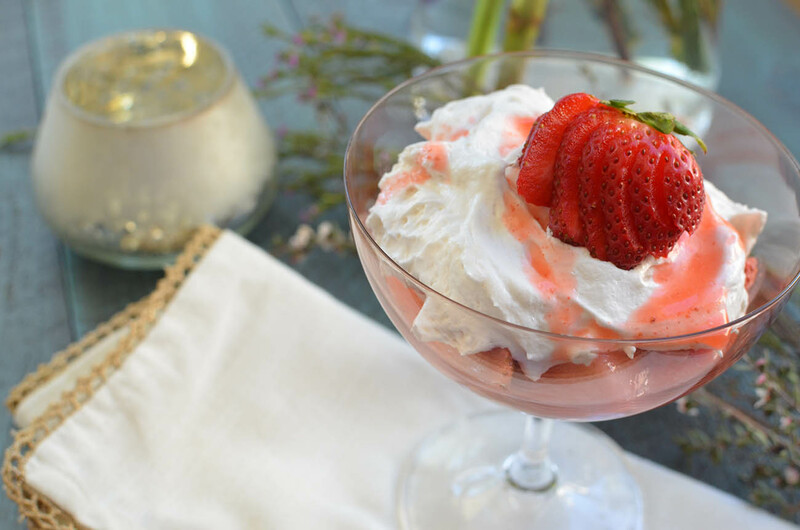 These white wine strawberries and cream desserts are simple to make and look incredible. With a bit of wine in each of the juicy strawberries and topped with cream, you can’t say no. Are you throwing an elegant spring gala with black tie attire? 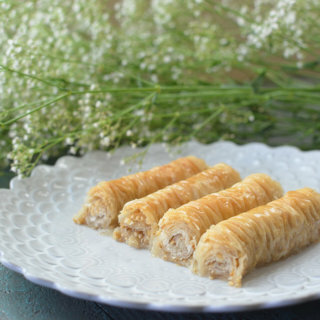 These are a perfect and simple dessert. Girl’s night in watching the latest hit series on Netflix? Dessert is set. 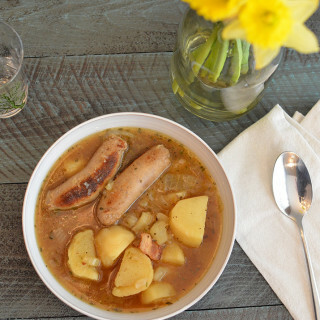 And let’s be honest, you’re more likely to find me at the latter, chomping down on this and playing board games–so it’s perfect for a variety of occasions. You might be thinking, Carolann, seriously, another strawberry recipe? But guys, it’s strawberry season!!!! Yeah, we have strawberries all year round, but the way they taste when they’re actually in season? Phenomenal. Last year we went for the first time as a family to go and pick strawberries at a farm. We had so much fun and my daughter couldn’t believe how many strawberry plants there were. We ended up getting a little strawberry plant after our trip so we could watch it grow, blossom, and produce berries. Delicious AND educational. This year we picked up a Chandler strawberry plant to grow and the fruit should be ready in June. These are the super tall strawberry plants that I’ve always wondered about. They just look so huge compared to the other little plants! Now that we have more space, I decided to give it a go. We haven’t been to the farm yet, but I’m trying to figure out a date that would work with our crazy schedules! If you can’t get to a farm, the strawberries at farmers markets or grocery stores work great too! 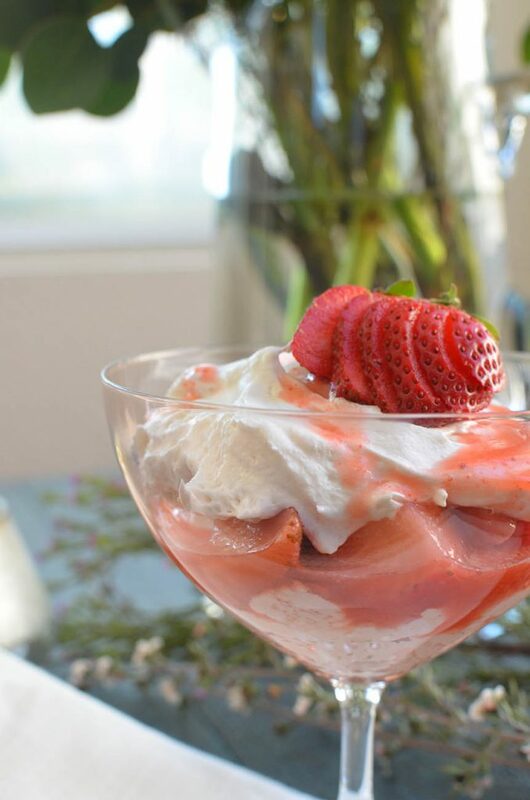 You will need a whole pint of strawberries to make white wine strawberries and cream (more if you would like to add a strawberry as a fancy topper). Put aside about 1 cup of strawberries when you start. This will be for a little additional drizzle of goodness. Take your remaining pint of strawberries and cut them into nice, bit sized pieces. Take your strawberries and place them in a bowl. Here’s where the magic begins! You’re going to pour the wine over the strawberries and let them soak in the refrigerator for three hours. It’s like an inverted sangria! Speaking of which, I need to get my sangria recipe up for you guys. It’s the stuff dreams are made of. While the strawberries are drinking up all the wine, take a metal mixing bowl and metal beater and place them in the freezer. 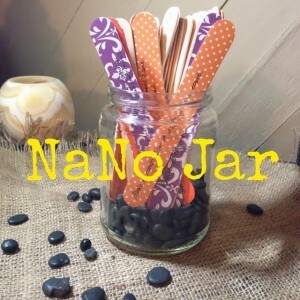 You will need this for later. Once the strawberries have soaked for 3 hours, prepare the rest of the dessert. Take the cup of strawberries you had put aside and blend them into a lovely liquid. Put aside. This is part of your topping. Pull your metal mixing bowl and beater out of the freezer and bring out your can of cold, full-fat coconut milk. Place the coconut cream (the hardened stuff at the top of the can) into the bowl and mix on medium for about a minute. Turn mixer to high speed and beat for about 5 minutes or until stiff peaks form and add your vanilla. Put a layer of cream at the bottom of a glass and spoon on a bit of the strawberry sauce. 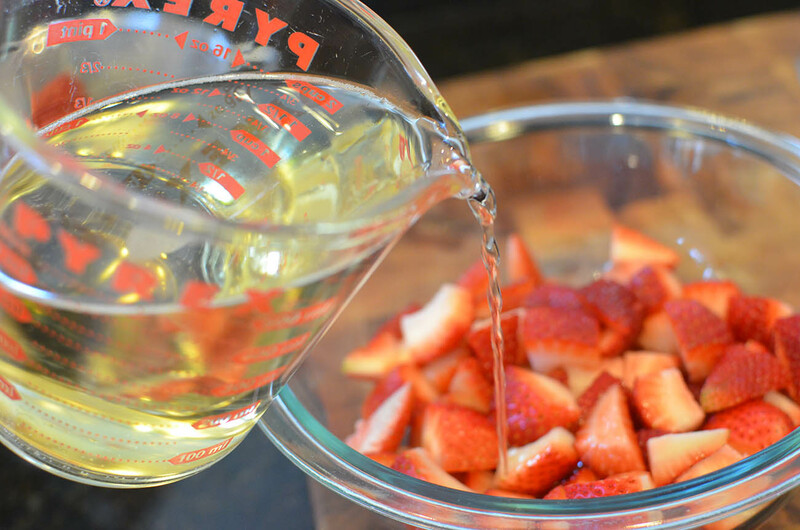 With a slotted spoon, gather some of the wine infused strawberries, taking care to drain the liquid, and spoon on top of the cream. Add more cream and strawberry sauce. If you want to make it a little fancier and have additional strawberries, go ahead and place one on top or you can use a mint leaf. Serve immediately and enjoy! 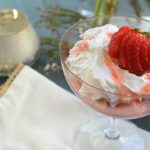 An elegant dessert of wine infused strawberries, coconut cream, and strawberry sauce that’s vegan and refined sugar-free. Cut strawberries into bite-sized pieces, reserving one cup to set aside for later. Place strawberries into a bowl and add 2 cups of wine. Place in the refrigerator and allow to infuse for 3 hours. 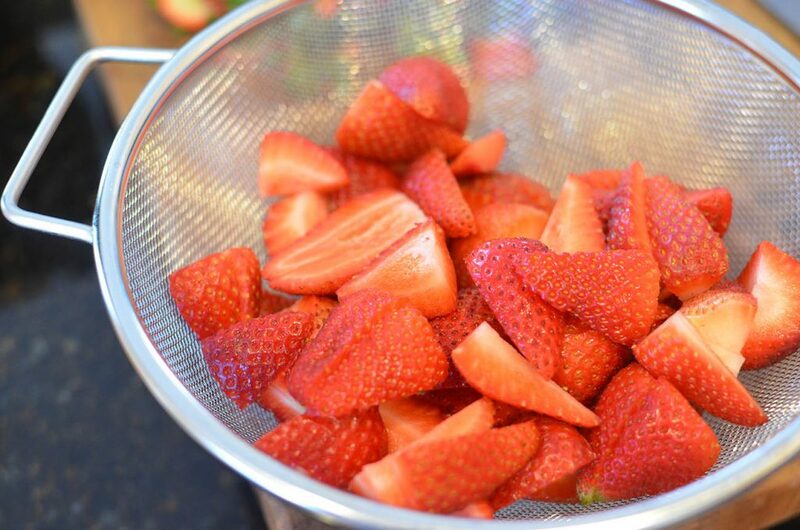 While the strawberries are soaking, take your metal mixing bowl and beater and place them in the freezer to chill. Once the strawberries have sat for 3 hours, pull them out of the refrigerator and start on the strawberry sauce and coconut cream. In a blender, add your cup of reserved strawberries and blend until a smooth liquid. Set aside. This next step you want to do in order and pretty quickly before the coconut milk and tools start to warm up. Remove your coconut milk out of the refrigerator and open it. Take your mixing bowl and beater out of the freezer and add the solid coconut cream at the top of the coconut milk can. Mix on medium for 1 minute, then on high for about 5 minutes or until stiff peaks form. Add your vanilla and mix for another 30 seconds. 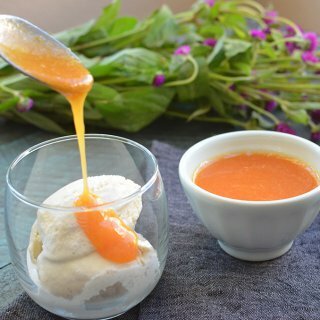 Place a scoop of coconut cream at the bottom of your serving glass, followed by a spoonful of strawberry sauce. With a slotted spoon, taking care to remove as much liquid as you can, spoon some of the wine infused strawberries on top of the cream/sauce. Add more cream and strawberry sauce. Top with a strawberry or mint leaf.